For BBC Presenter Babita Sharma twitter is a place for exchanging information and interacting with fans. A notoriously secretive persona, one such interaction with her fan led her to disclose the biggest secret about her personal life. The Indian origin presenter has been at the forefront of major breaking news covering the death of Osama bin Laden, the Paris attacks, the death of Kim Jong Il and the Arab uprisings. 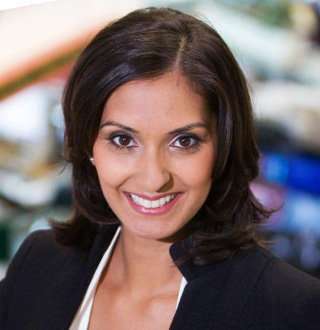 She is currently the presenter of BBC World News show, Newsday after joining BBC in 2015. Babita is very active on Twitter and has more than 30.2k followers as of October 2018. Born on 19 July 1974, Babita Sharma grew up in Reading despite London Borough of Lewisham being her birthplace. Babita grew up in the English county listening to the stories of how her father was affected by the partition of Indian and Pakistan in the after math of India's independence from the British government. Babita’s father was one amongst many who were affected by the Partition of British India. Discussing her new BBC Two series World's Most Dangerous Border, the Lewisham native, aged 44, revealed that her father was just four years of age when he and his mother located from Sialkot (Now Pakistan) to Delhi India in fear of being executed by Muslim rioters. The BBC host, of height 5 feet and 6 inches grew up embracing her parents' heritage and studied at the University of Wales where she graduated with a degree in Journalism, Film, and Broadcasting. Babita Sharma is a woman with multiple talents. She is a documentarian, TV Presenter, BAME spokesperson and News Anchor for the BBC. Moreover, she is known for fronting documentaries and programmes for BBC One, BBC Two & BBC Four. The talented presenter of Indian heritage was named as one of the BBC’s ‘Talents to Watch’ for 2017/2018 and is paid a salary to match her talents. Despite having her salary undisclosed one can guess she earns a hefty sum through her net worth. Despite having just started to make a name for herself within the media circle, she has already accumulated a hefty net worth of $5 million. Babita, whose professional career is like an open book to the public has the personal life just opposite--as she has hidden her personal front behind the curtains which has created a lot of questions regarding if she is married or not. However, being very active in social media she has dropped more than subtle hints about being married. She took it to twitter to notify that the next event in her life was going to be her wedding on 29 August 2017. However, there was no any official news regarding her wedding or about her husband. After almost a year after she announced about her wedding she once again created hullabaloo in the media after tweeting about her husband. After remaining silent on her personal front for more than a year, revealed on Twitter that her husband was Irish. In response to one of her Irish fan praising her documentary Booze Beans and Bhajis, she mentioned of her thankfulness for the compliment and added that her husband also belonged to Irish heritage and she was also growing accustomed to Irish culture in January 2018. Well, that surely was it and its indeed a strong proof regarding that she is married. As no photos from their marriage have been released as of yet, it can be said that their marriage ceremony happened in a private event and out of media's reach.